We would like to express our deepest appreciation to everyone who has given us an award. Congratulations! 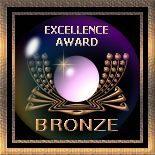 Your site at: http://www.extraplicity.com/ has been selected as a "Bronze" Award winner for the American Association of Webmaster Awards. Great Site, navigation, design, graphics and appearance. We were very impressed with the quality information, content, creativity and design your website presents. We enjoyed our visit and wish you the very best with your site. Thank You for applying for my awards. I have enjoyed my visit at your site. After reviewing your site, I am pleased to present you with "Bronze" Award. Keep up the great work on your page. Congratulations! Your site "Extraplicity" has been reviewed by all our judges. We enjoyed our visit to your site and we are pleased to announce that your site has won our "Bronze Award". You have obviously put a lot of thought and work into the design and in maintaining your pages. Congratulations once again and keep up the great work. We have completed our evaluation of your site and are pleased to present you with our TOTW Treasured Web Awards Bronze Award which is attached. We can see that a lot of time and effort has gone into the compilation of your information. We enjoyed our visit to your site and your beautiful photography. Congratulations! ... only 8 awards are being presented this month out of 107 applications. Congratulations on being one of the 8! ....... and thank you for your support of Treasures Of The Web. Vicki Reece ... aka "Treasure"